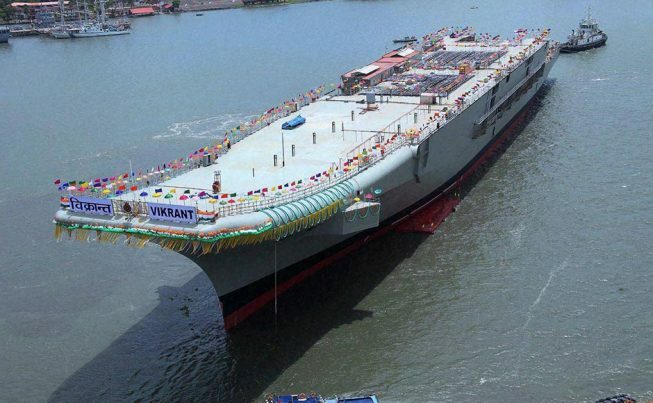 (NationalSecurity.news) China made operational its first aircraft carrier, the Liaoning, in recent years and is building a second carrier, the first indigenous ship of its class. As Chinese naval power grows and as Beijing is making aggressive moves to “build” islands in the South China Sea, all of these factors have combined to lead a “strategic pivot” to Asia by the Pentagon. But given the reality of Obama-era defense cuts, the Pentagon is finding it tough sailing in dedicating the resources it likely needs to deter rising Chinese aggressive. Given Russian moves in East Europe and the Middle East and the lingering problem of the Islamic State, defense planners are scrambling to assemble the resources and manpower necessary to complete the pivot. One way the Defense Department is bridging the resource gap is by relying more heavily on local Asian allied forces, especially naval assets. Another way it plans to leverage allies in the region is by providing key allies with the technology to bolster their own forces, all with an eye toward countering Chinese moves. The two countries agreed to work together on aircraft carrier technology as well as jet engines during U.S. President Barack Obama’s visit to India last year in a strengthening of ties to balance China’s expanding military power in the region. A high-level working group consisting of U.S. and Indian officials are set to meet this month in New Delhi as part of several meetings designed to broaden cooperation on the design of the carrier, as well as its development and production. “We are making very good progress, I am very pleased with the progress to date and optimistic we can do more in the future. That’s on a very solid track,” Richardson told reporters in New Delhi. India is currently undergoing a naval renaissance after years of neglect. Some 40 warships are currently under construction and the government approved 12 new submarines, six of which will be nuclear-powered. Right now the Indian Navy operates two carriers – an old carrier from Russia inducted in 2014 and an aging British carrier than will be retired this year. India is building an indigenous carrier and that ship should enter service in the 2018-19 timeframe. That said, the Indian Navy is also planning a third carrier, the largest so far, and that’s partly why New Delhi is seeking American technological assistance, especially with state-of-the-art aircraft launch systems. Richardson noted that electromagnetic launch technology that will allow the U.S. Navy to launch heavier planes from carrier decks was part of the conversation with officials in India. “All of those things are on the table, there are possibilities, its a matter of pacing, it’s very new technology for us,” he said. If India pulls off this kind of cooperation, The National Interest notes in a report on the negotiations, it will be “nothing short of a coup.” Building carriers is not an easy task; getting all the moving parts to operate and be durable is a massive undertaking and it’s partly why it took China from 1985 to 2012 to put is first, small-ish, refurbished Soviet-era carrier, to sea. Also, India’s carrier relationship with Russia was fraught with problems, delays and cost overruns – all things that would largely be solved by a carrier technology deal with the U.S.